Entrance to the Tower of London with a visit to the Crown Jewels and a tour with a Beefeater guard. Ver opiniones de Entrance to the Tower of London with a visit to the Crown Jewels and a tour with a Beefeater guard. The ideal choice for families. You must reach the Tower of London on your own, on the banks of the River Thames. With your entrance, avoid long queues at the main ticket office, and pass through the group entrance and security to access this imposing palace-fortress. 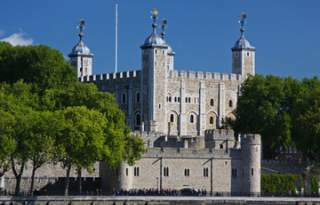 Built by William the Conqueror in 1066, the Tower has a dark 1,000-year history as a royal palace, prison and execution site, as well as a royal mint and armoury. Today, it still contains the Crown Jewels of the British monarchs, as it has since 1303. Once inside, explore the site on your own or choose the optional audio tour (not included in the price) or the free tour led by a beefeater guard, one of the ceremonial guards. Visit the main tower, the White Tower, to see the exhibition of the royal armoury, and enter the bloody Tower, famous for being where the princes of the tower were killed by an unknown man around 1483. Visit the Gate of the Traitors, where the prisoner Anne Boleyn was brought by boat from the River Thames. Then stroll to the Tower Camp, where she was beheaded in 1536 by Henry VIII, and where several kings and traitors also found their spooky end. Go back to Tudor times in the Medieval Palace, where medieval interior details recreate the comfortable lifestyle of the monarchs of the Tudor dynasty such as Henry VIII, and stretch your legs walking along the wall, strolling along the gigantic circular walls to discover more places of interest. Finally, don't miss the Crown Jewels, accessories and precious stones that symbolise the British monarchy. Join the inner queue to see these brilliant objects, including Edward's Crown, used in coronations since 1661, and the legendary Koh-i-Noor, the 105.6-carat diamond given to Queen Victoria in 1849. After exploring the place at your leisure, leave and return home or to your hotel on your own. Superior option: Royal Palace Pass Want to discover more of the fascinating history of the royal family in London? Then choose the superior option of the Royal Palace Pass, which offers you a priority entrance to the Tower of London alongside the entrance to the Palace and gardens of Hampton Court and Kensington Palace, the former royal residence of Queen Victoria and Princess Diana. Your Royal Palace pass entitles you to one visit to each of the three points of interest and is valid for two years, so you'll have plenty of time to freely enjoy each place and discover its captivating past at your own pace. Departure point: The Tower of London is located on the eastern boundary of the City of London, next to the River Thames and the Tower Bridge. Departure time: If you buy your ticket online in advance you can avoid long queues by using the group ticket poster window. Fast and easy. We recommend that you devote 3 hours to the visit. From 1 March to 31 October: Tuesday to Saturday from 9.00 a.m. to 5.30 p.m. Sunday and Monday from 10.00 a.m. to 5.30 p.m. The entry deadline is 5.00 p.m. From 1 November to 28 February: Tuesday to Saturday from 9.00 a.m. to 4.30 p.m. Sunday and Monday from 10.00 a.m. to 4.30 p.m. The entry deadline is 4.00 p.m. Tickets are valid for 7 days from the date selected when making the reservation. Things to do near Entrance to the Tower of London with a visit to the Crown Jewels and a tour with a Beefeater guard.